Since Jammeh came to power, he has continuously threatened to enforce disappearance without trace and killing of opponents. 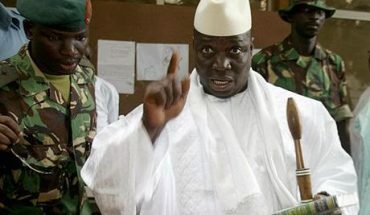 President Yahya Jammeh of The Gambia has sworn he would kill his opponents and bury them “nine-feets-down” with enforced disappearance while addressing a crowd in the northeastern town of Farafenni about 72 miles from capital Banjul. Mr Jammeh made this statement a week after the European Parliament urged member states to freeze budgetary and non-humanitarian aid and impose travel bans on Mr Jammeh and his associates. “Let me warned those evil venom call oppositions, if you want to destabilize this country, I will bury you nine-feet deep and no westerner dare say anything, let make that very clear to you,” he said. Jammeh has joined his Deputy Ambassador to the UN, Samsudeen Sarr (who said he would shoot to kill protesters) in accusing Western governments of sponsoring peaceful demonstrators demanding reforms saying their intent into destabilize the country, render it ungovernable and use a mass uprising to oust the Jammeh regime. Came to power in bloodless coup. Jammeh came to power through a “bloodless” coup in 1994 ousting the three decade government of Sir Dawda Jawara and seeking a fifth term. Rare protests erupted in Banjul and Serrekunda which were brutally suppressed by a paramilitary police force. The United Nations said at least three people have died including a senior opposition figure, Ebrima Solo Sandeng. It is not the first time that President Yahya Jammeh who has absolute grip of the country’s politics and life made such threats to the opposition. He has carried out most of them with no consequences. 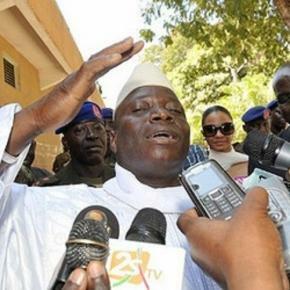 Jammeh sparked an international outcry in the fall of 2012 after executing nine people without due process. The EU held more than 33 million Euros in aid to the country and relations between the two strained after demands by the EU for the Gambia to uphold rights and implement a list of demands that Mr Jammeh said are draconian. “Jammeh’s remarks are not just threats – they are an acknowledgement that his regime kill people and detain others incommunicado and no one can do anything about it at least for now,” said Bakary Badjie of #NewGambia2016 Movement. Badjie said the country has seen former Speaker of National Assembly, Chief Justice, ministers, permanent secretaries, security officers jailed, journalist Deyda Hydara killed and Chief Manneh, Jassaka Kujabi and many others disappeared for years. In January 2015, more than 30 family members and friends of those who took part in an attempt to overthrow President Jammeh when he was supposedly out of the country were arrested and detained incommunicado. Detainees were as young as 13 and some as old as 85 and calls for their release were largely ignored by the Gambian authorities. Four Americans have been charged and sentenced for violating the Neutrality Act for participating and supporting the early morning siege on The Gambia’s presidential compound. A UN and State Department rights report says the National Intelligence Agency, which directly reports to President Yahya Jammeh has been largely used to enforce disappearance without trace.